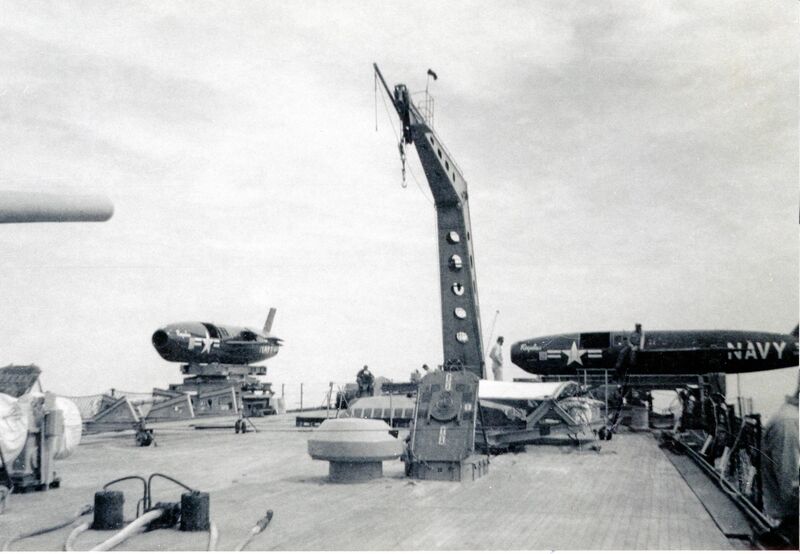 Armor, 6" Belt, 8" Turrets, 2 1/2" Deck, 6 1/2" Conning Tower. 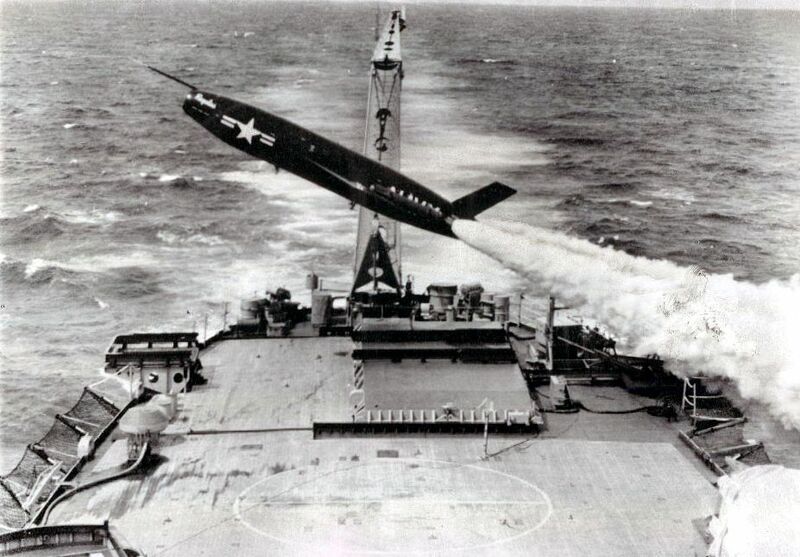 Speed, 33 Knots, Crew 2000. 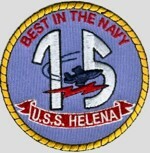 After USS Helena (CL 50) was sunk in 1943, the new light cruiser, CL 113 was named in her honor. 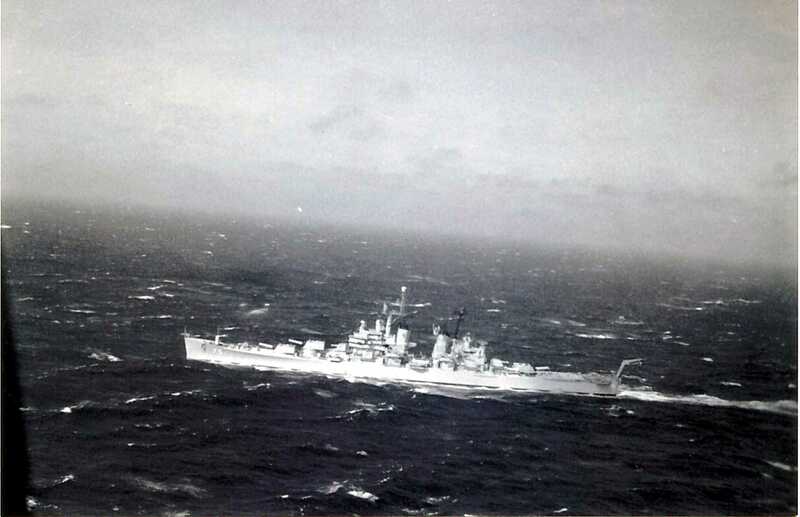 This ship was canceled in 1944, so, in order to keep the name alive CA 75 was renamed as Helena 06 NOV 1944. 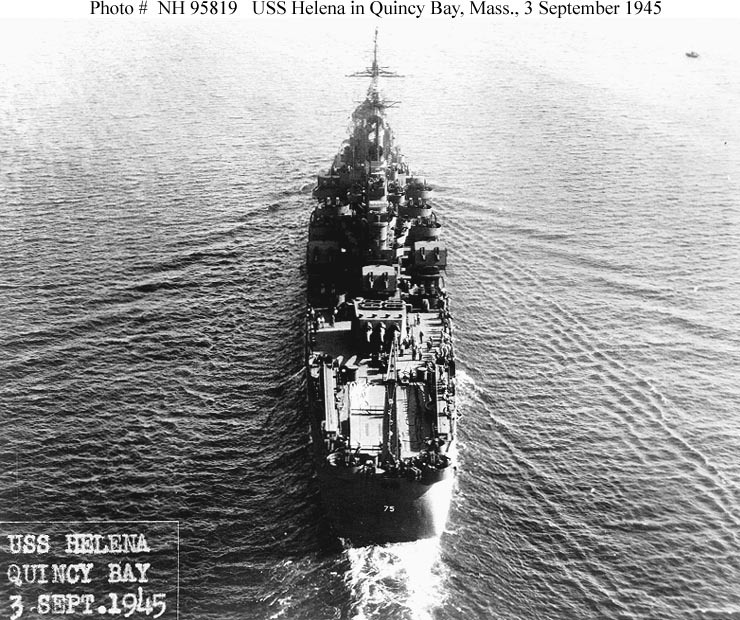 USS Helena (CA 75) Underway in Boston Harbor on 3 September 1945, the day before she was placed in commission. Courtesy of the U.S. 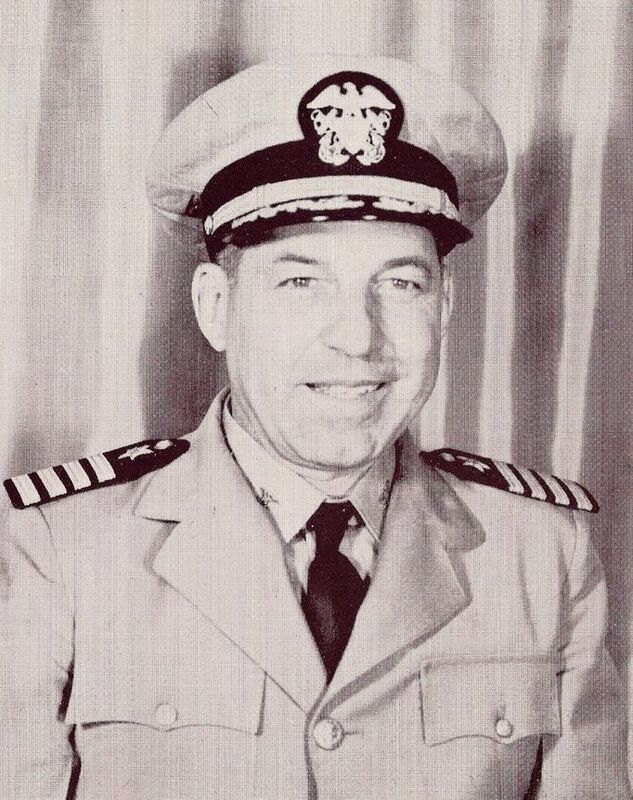 Naval Institute, James C. Fahey Collection. U.S. Naval Historical Center Photograph #NH 95817. 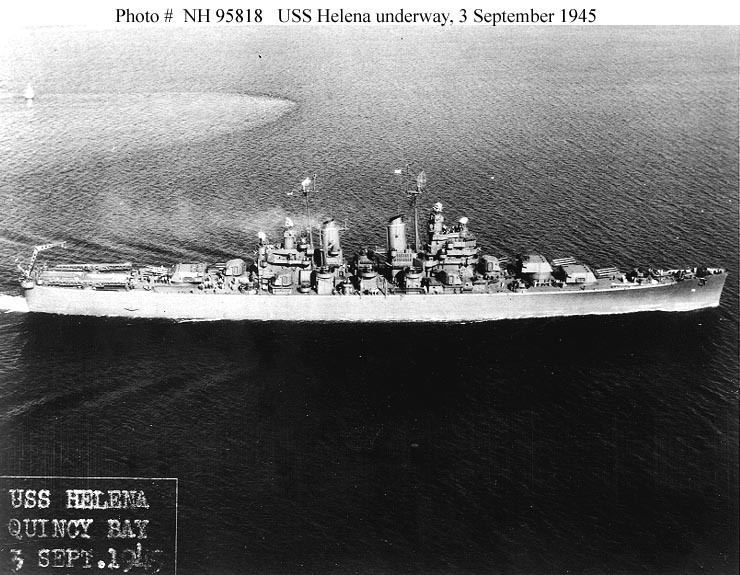 USS Helena (CA 75) Underway in Quincy Bay, Massachusetts, on 3 September 1945, the day before she was placed in commission. Courtesy of the U.S. 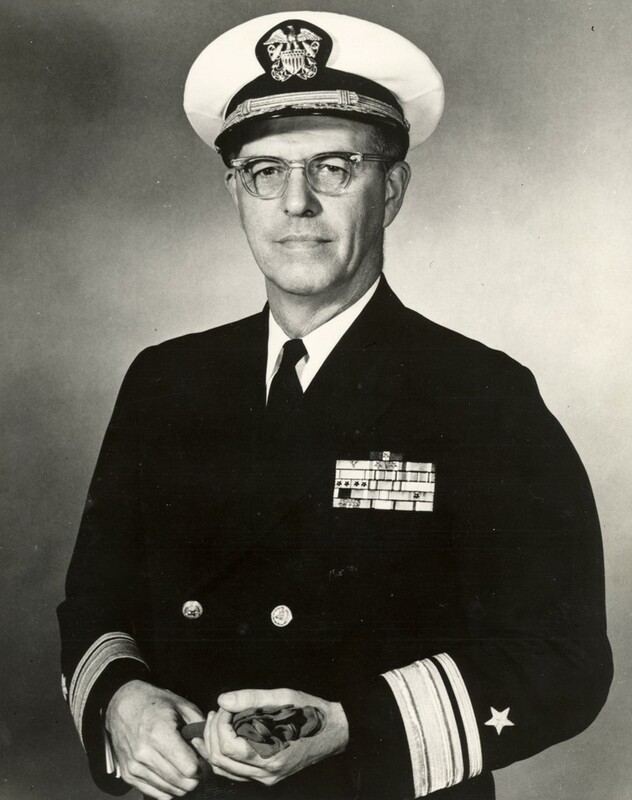 Naval Institute, James C. Fahey Collection. U.S. Naval Historical Center Photograph #NH 95818. 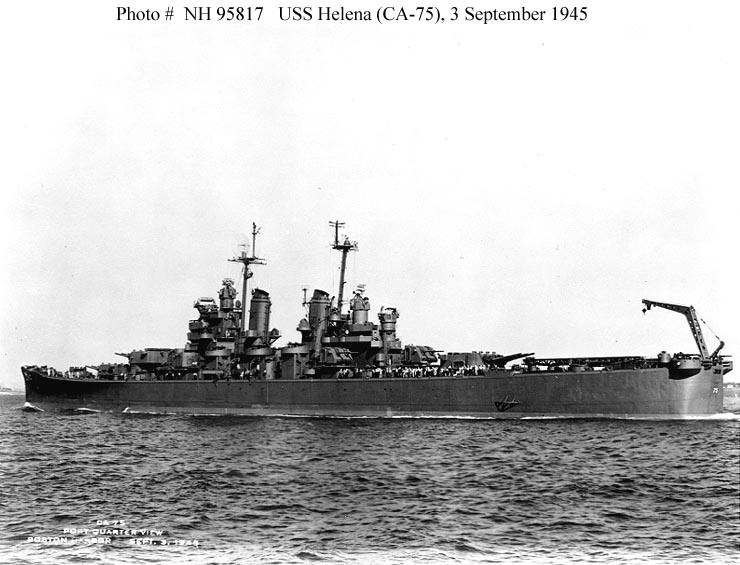 USS Helena (CA 75) In Quincy Bay, Massachusetts, on 3 September 1945, the day before she was placed in commission. Courtesy of the U.S. 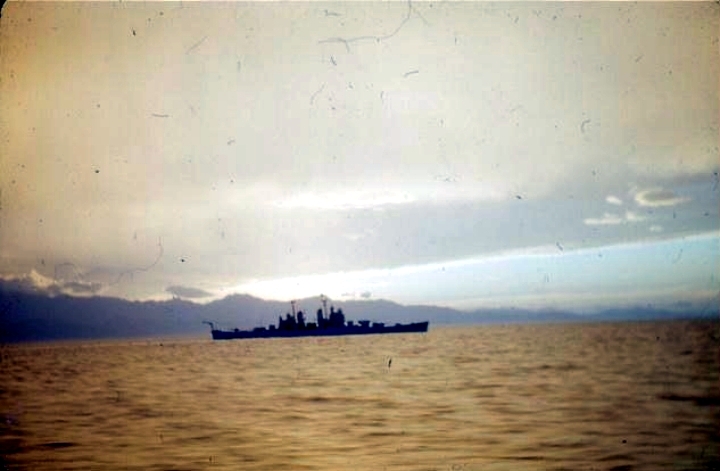 Naval Institute, James C. Fahey Collection. U.S. Naval Historical Center Photograph. #NH 95819. 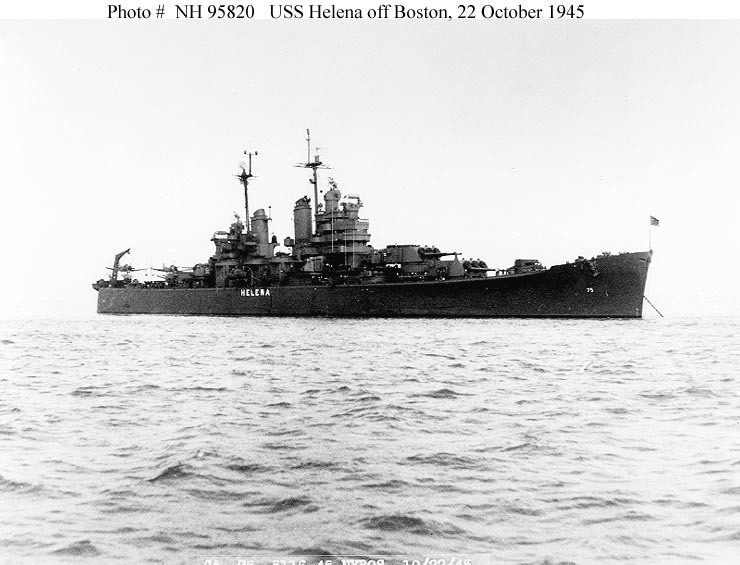 USS Helena (CA 75) Off the Boston Navy Yard, Massachusetts, 22 October 1945. 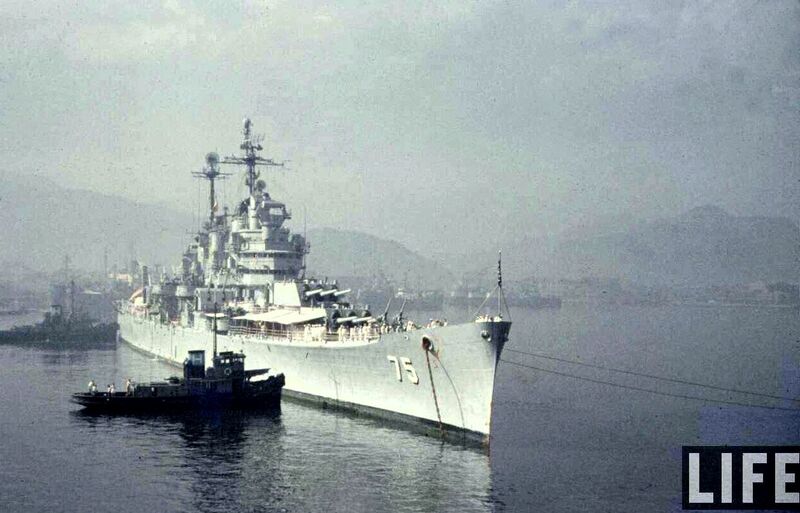 Her name has been painted on her side in preparation for the Navy Day Fleet Review at New York City on 27 October. Courtesy of the U.S. 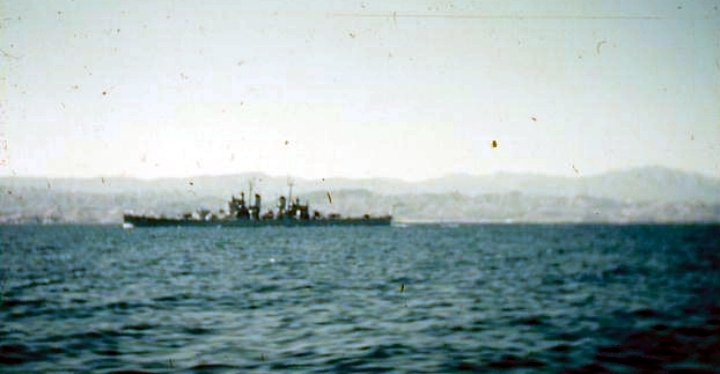 Naval Institute, James C. Fahey Collection. U.S. 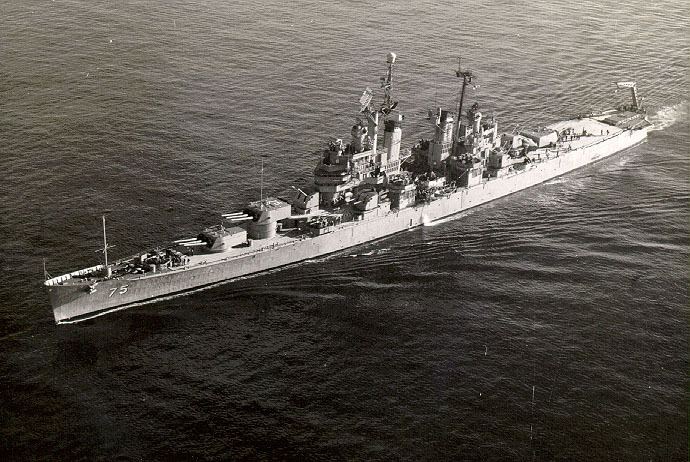 Naval Historical Center Photograph #NH 95820. 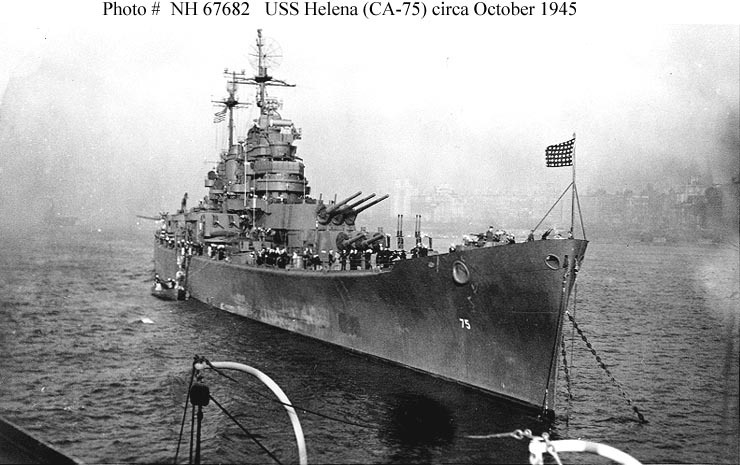 USS Helena (CA 75) Probably photographed in the Hudson River, off New York City, during the Navy Day Naval Review, circa 27 October 1945. Courtesy of Donald M. McPherson, 1969. U.S. 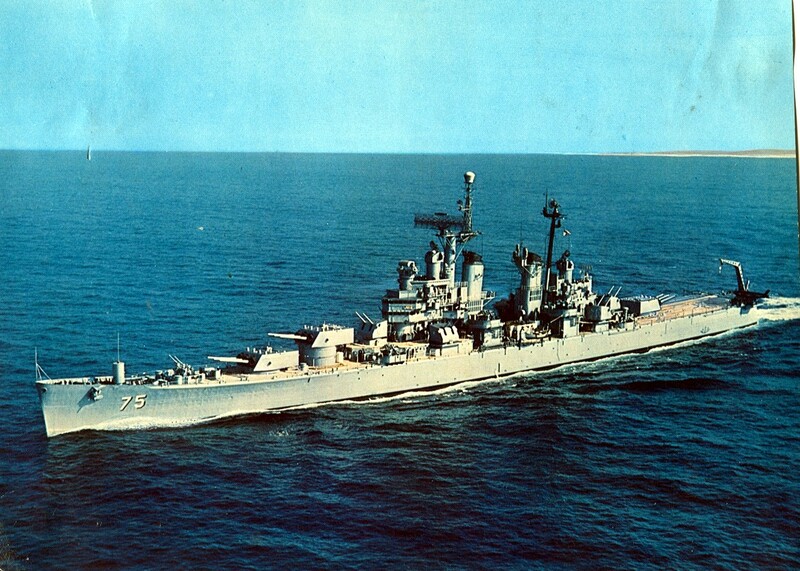 Naval Historical Center Photograph #NH 67682. 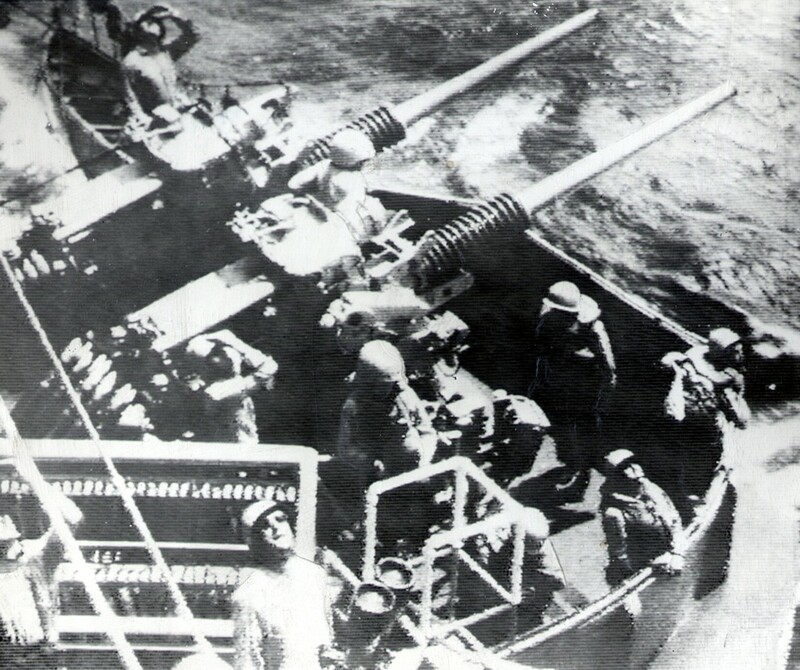 USS Helena fires a broadside from her 8"/55 main battery at Chongjin, North Korea, on 12-13 OCT 1950. 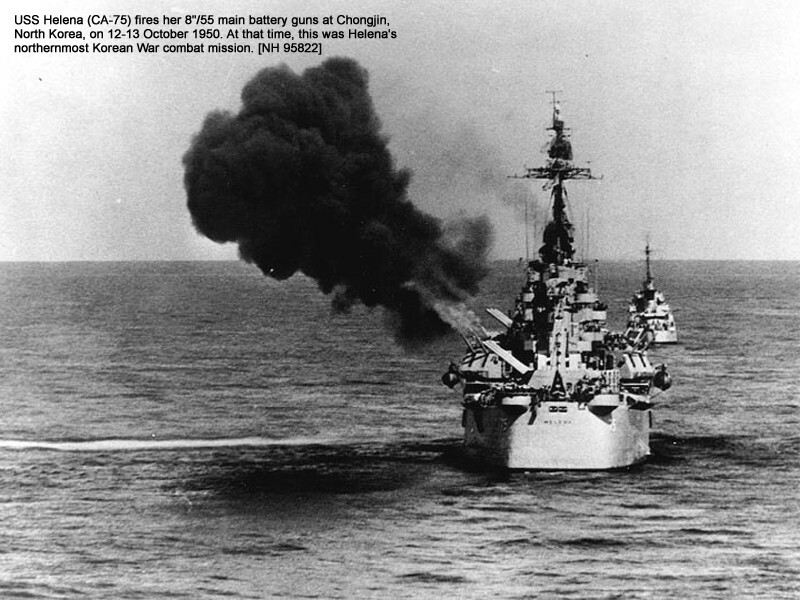 At the time this was Helena's Northernmost Korean War combat mission. Naval Historical Center Photo #NH 95822. From the collection of N.A. 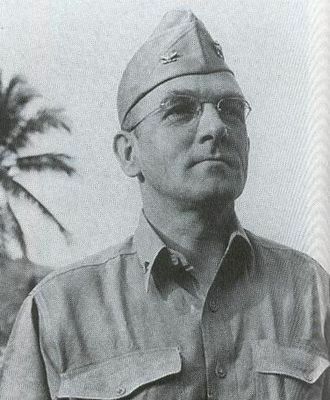 "Stretch" Brown (forwarded by Carol Edgemon Hipperson author of Radioman: An Eyewitness Account of Pearl Harbor & World War II in the Pacific). 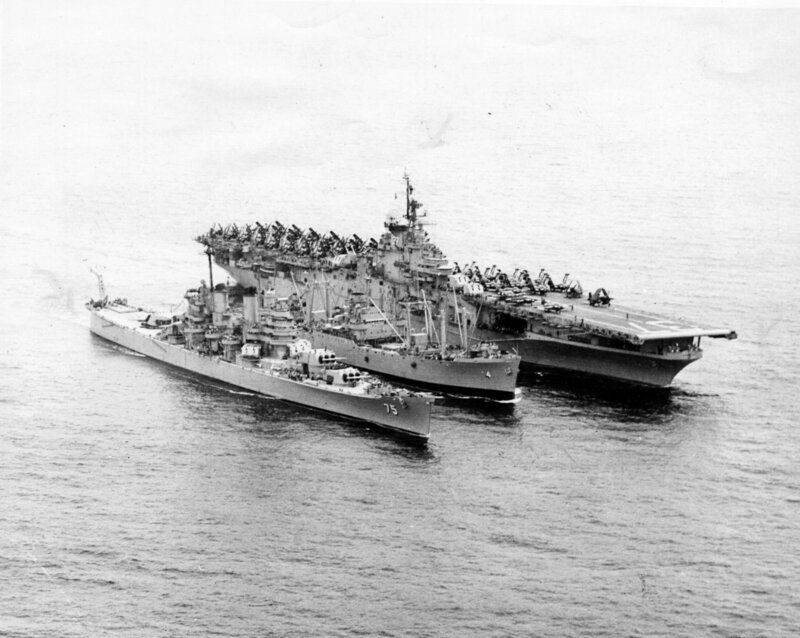 USS Mount Baker (AE 4) conducting an underway replenishment with the cruiser USS Helena (CA 75) and the aircraft carrier USS Princeton (CVA 37), in 1952 off Korea. 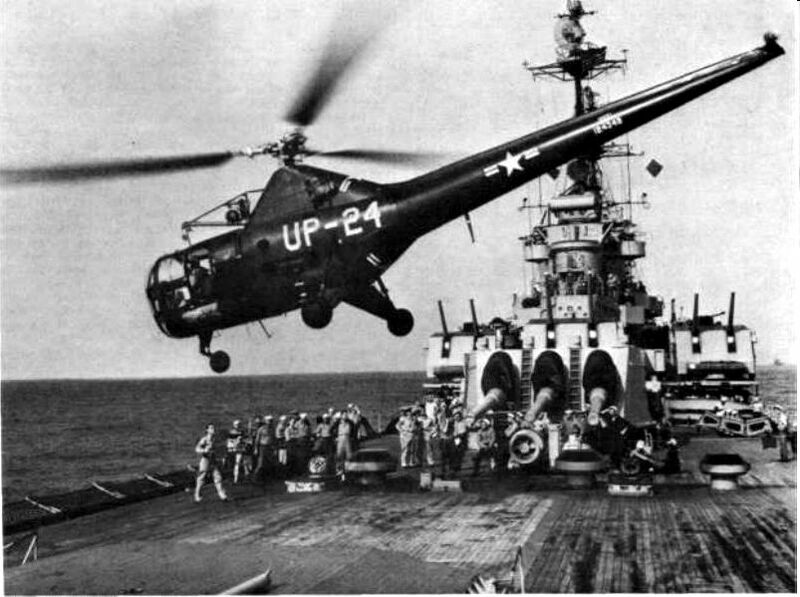 US Navy photo Vallejo Naval & Historical Museum File AE 4 139X2-7-52 TH. 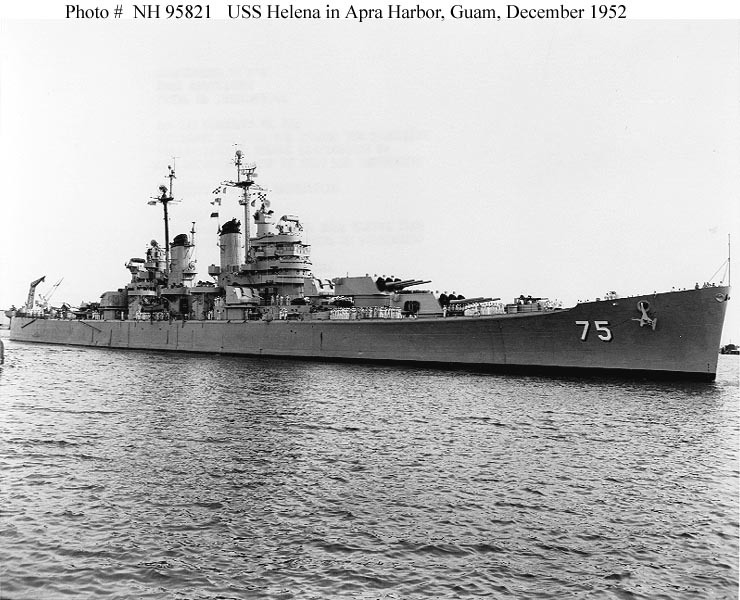 USS Helena (CA 75) In Apra Harbor, Guam, December 1952, while en route to the U.S. following her third Korean War combat tour. 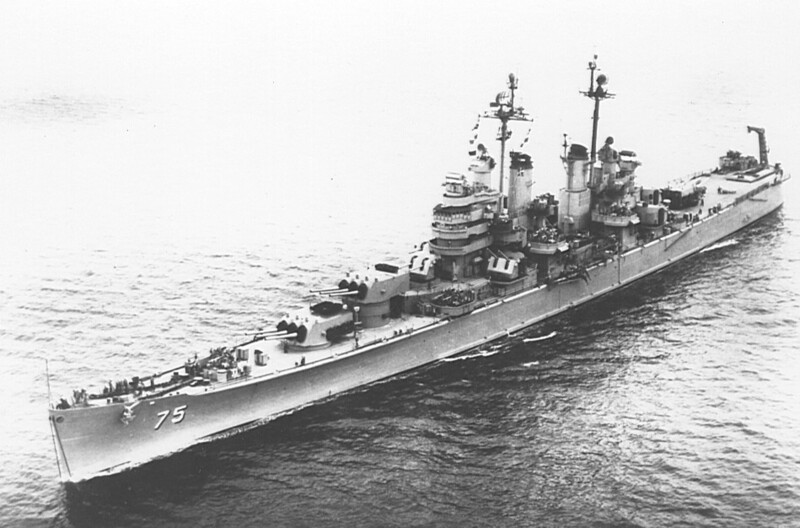 During this voyage, she carried President-Elect Dwight D. Eisenhower and his party from Guam to Pearl Harbor. Courtesy of the U.S. 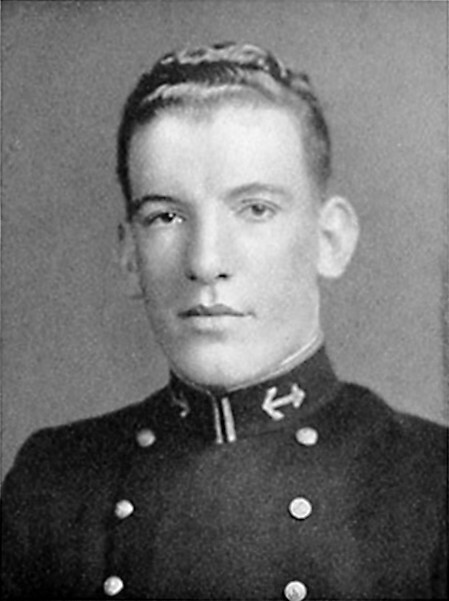 Naval Institute, James C. Fahey Collection. U.S. 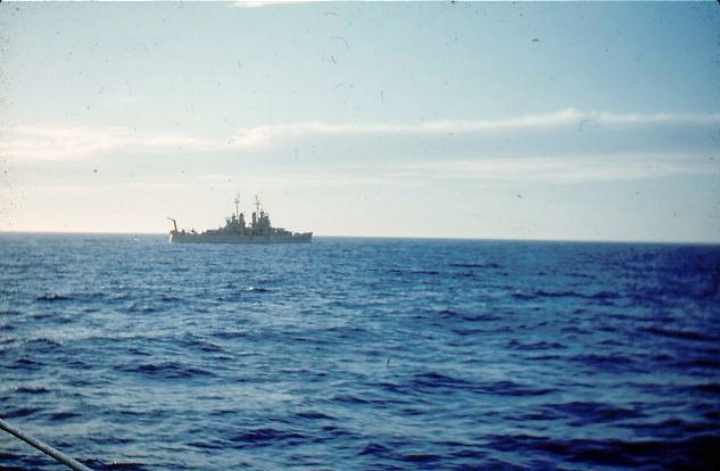 Naval Historical Center Photograph #NH 95821. 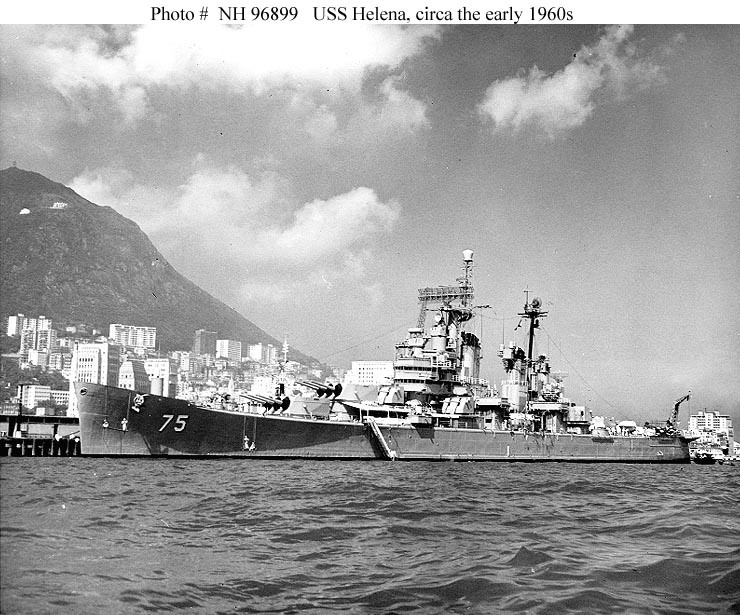 USS Helena (CA 75) anchored at an unknown Far East port in early 1956. 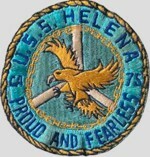 During the six months of this tour of duty, she once more operated primarily in the Taiwan area and briefly in Philippine waters on exercises, returning to Long Beach 8 July. Life Magazine Archives, Hank Walker photographer, shared by Peter DeForest. 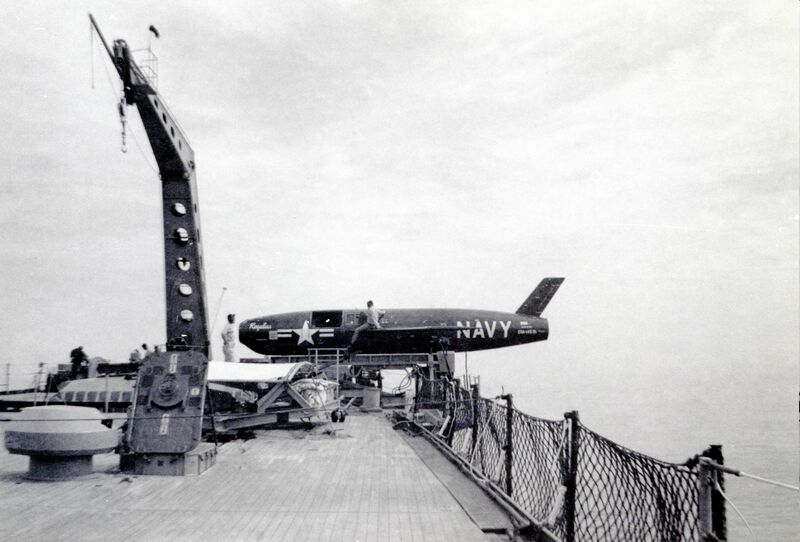 Sailors aboard the USS Helena (CA 75) inspecting a Regulus missile mounted on the stern of the ship. 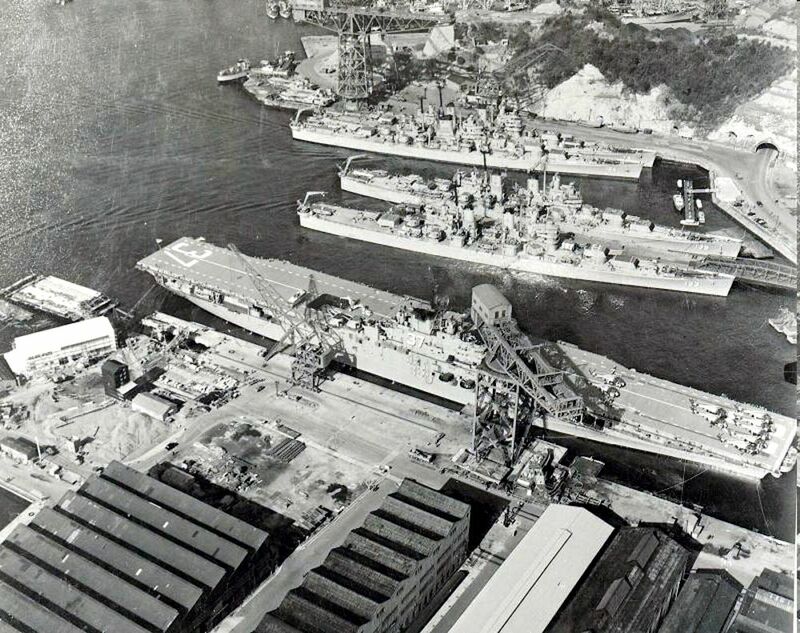 The Helena is moored at an unknown Far East port in early 1956. 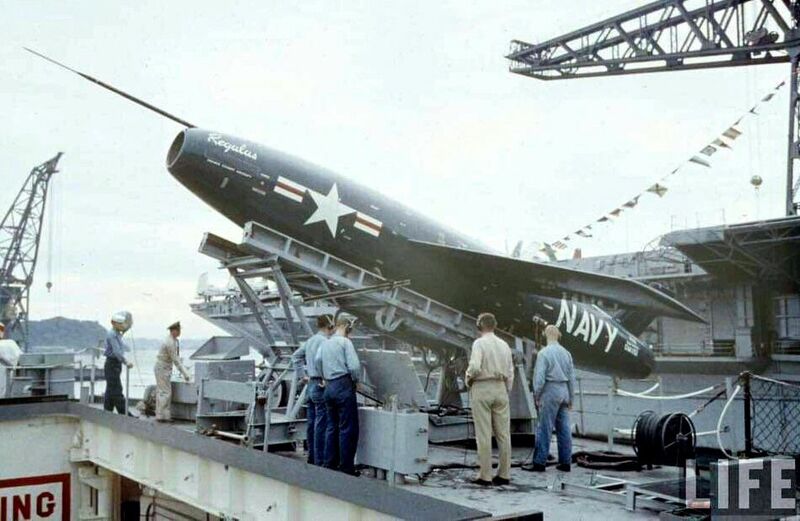 USS Helena (CA 75) With a Regulus I guided missile on her fantail being readied for firing during tests off Monterey, California, in early 1957. Courtesy of the U.S. 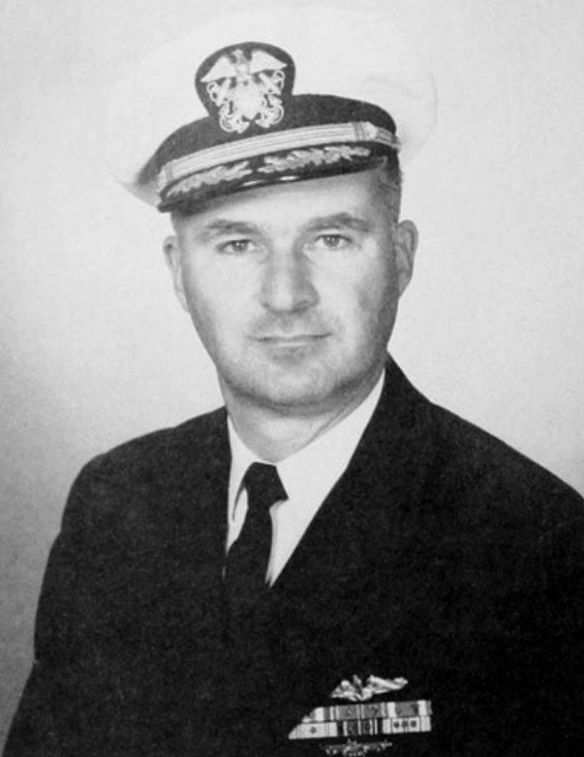 Naval Institute, James C. Fahey Collection. U.S. Naval Historical Center Photograph #NH 95824. 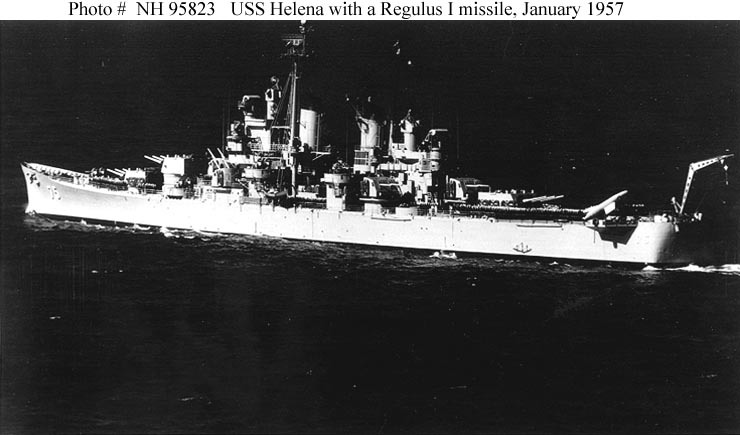 USS Helena (CA 75) Underway in January 1957, with a Regulus I guided missile on her fantail launching platform. Courtesy of the U.S. 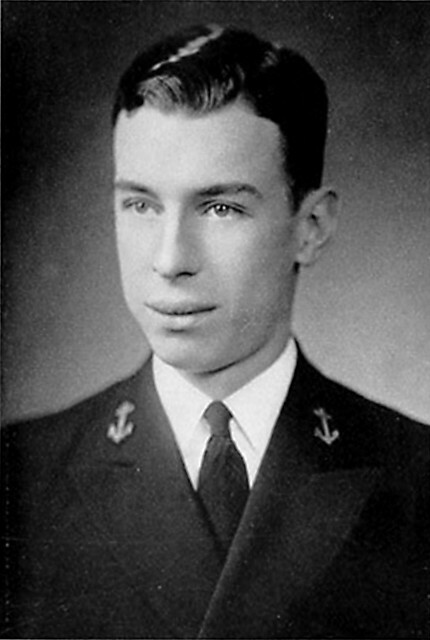 Naval Institute, "Our Navy" Collection. U.S. Naval Historical Center Photograph #NH 95823. 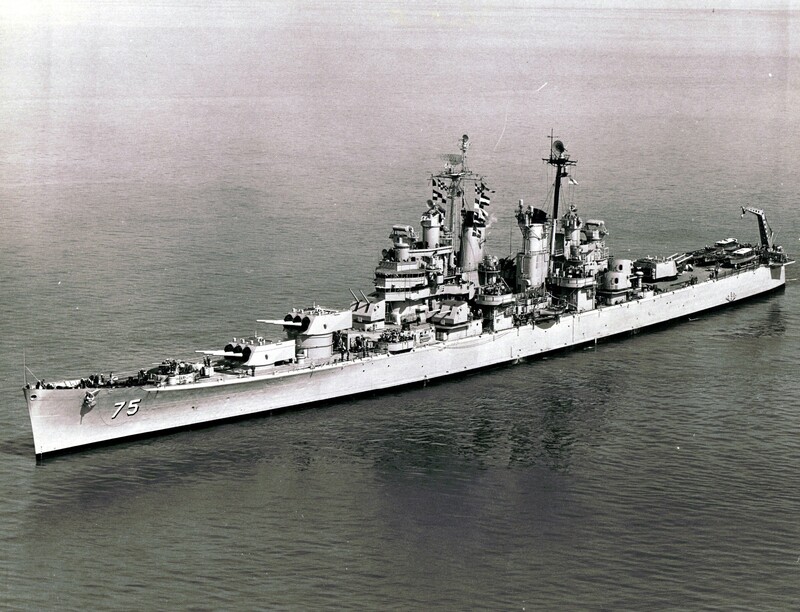 USS Helena (CA 75) underway in San Francisco Bay, 1958. Photo by Allied Photographers of San Francisco. 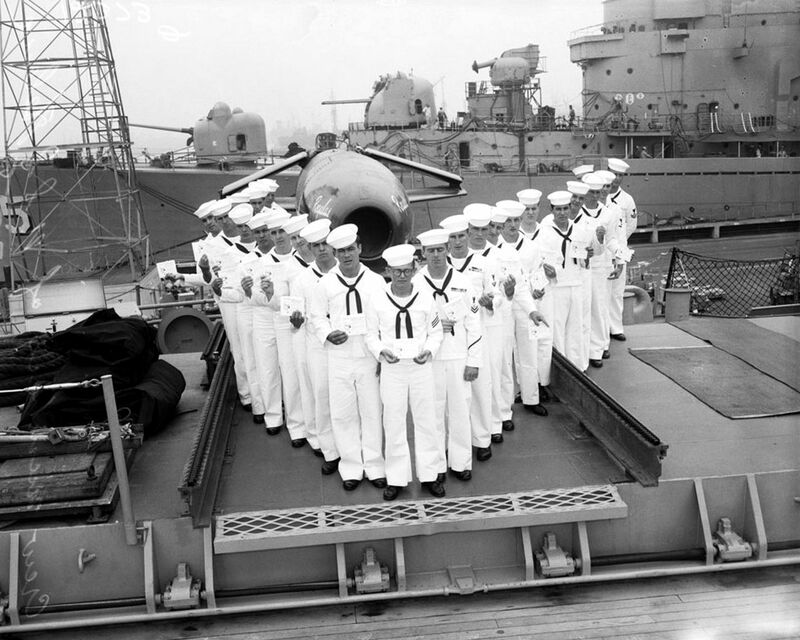 Los Angeles Examiner (7 July 1958) - Thirty-two members of cruiser Helena (CL 75) who saved life of heart surgery victim by giving blood award. Their blood saved the life of heart surgery victim. 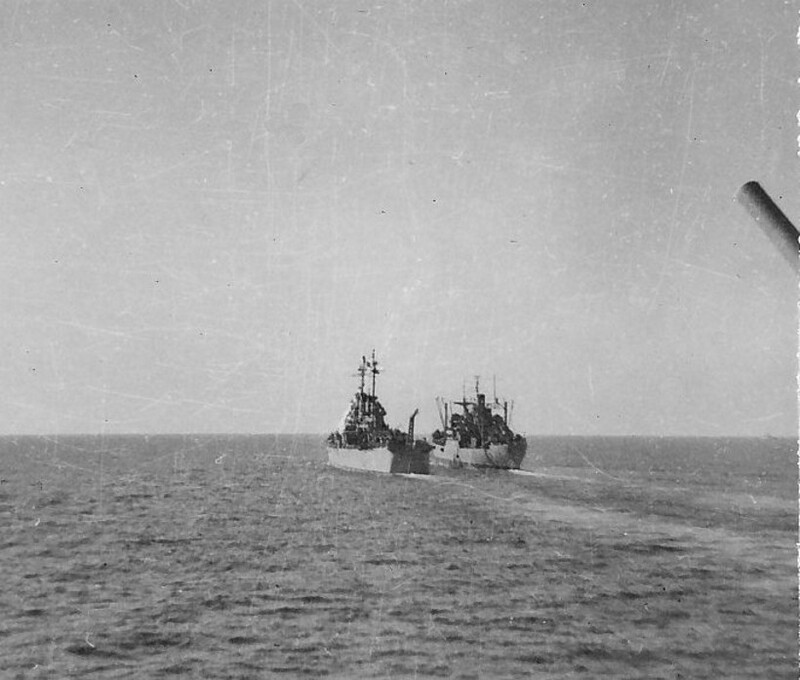 32 members of the heavy cruiser Helena form "V" around a Regulus on the fantail of the Helena after they had been given Red Cross special citation. The operation was successful. 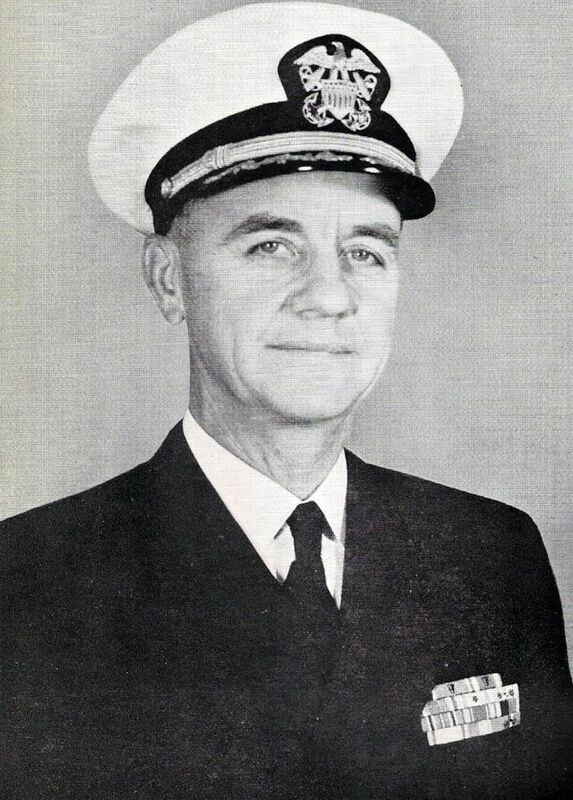 Entire crew witnessed ceremonies in which Rear Admiral M.H. Hubbard, commander Cruiser Division 3, presented the citation and shook hands with the men. 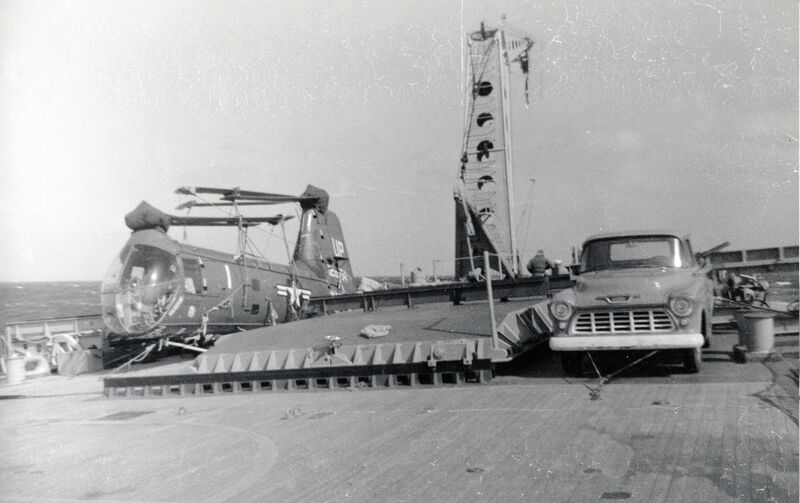 The ship in the background is the USS Wikinson (DL 5) with her forward 5"/54, 3"/50 and Weapon Alpha mounts visible. 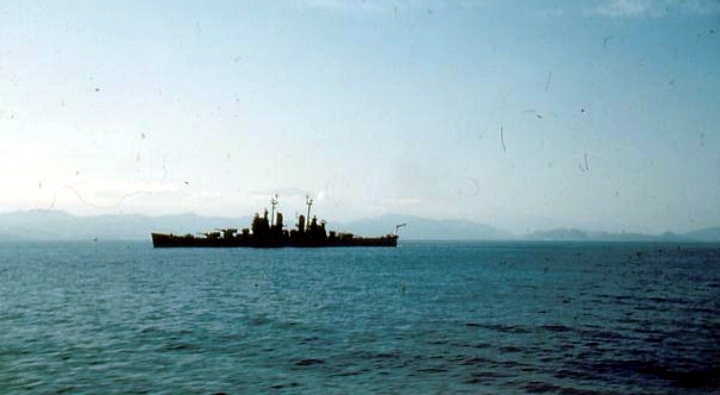 USS Helena (CA 75) At Hong Kong in 1961-62. 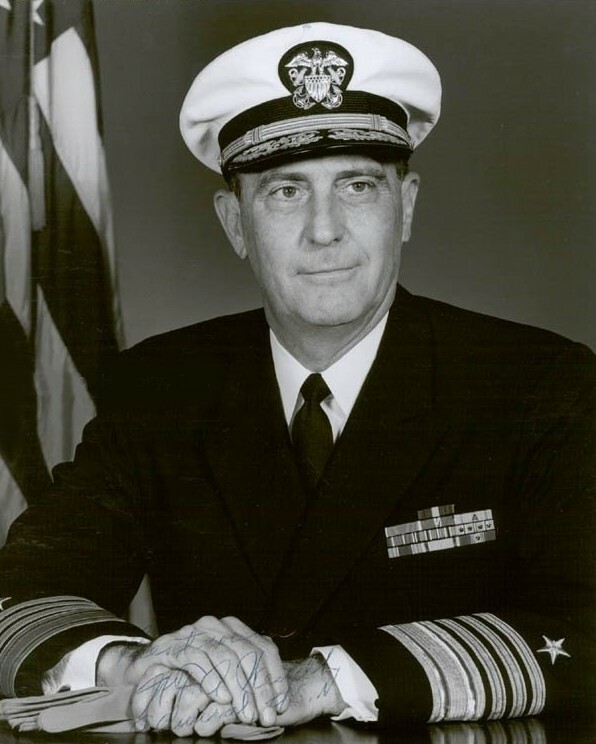 Official U.S. Navy Photograph, from the collections of the Naval Historical Center #NH 96899. 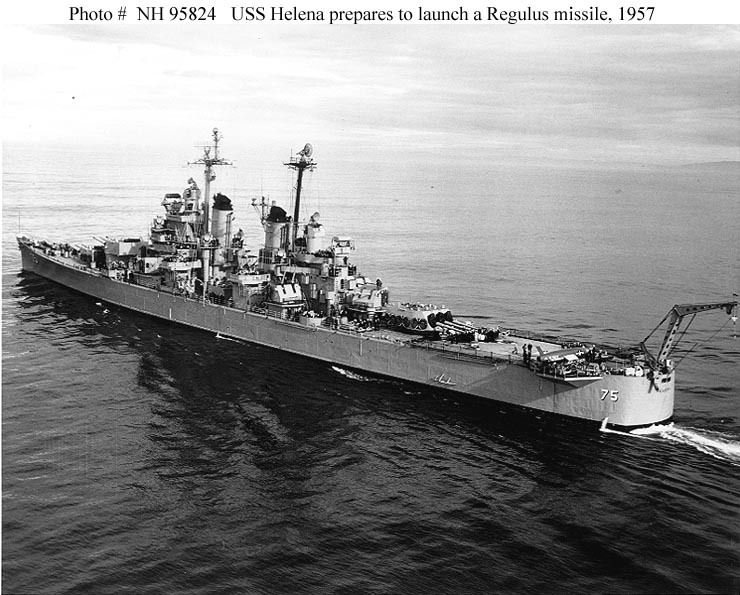 USS Helena (CA 75) At sea in 1961-62, following modernization with a new foremast supporting the very large antenna for SPS-43 radar. 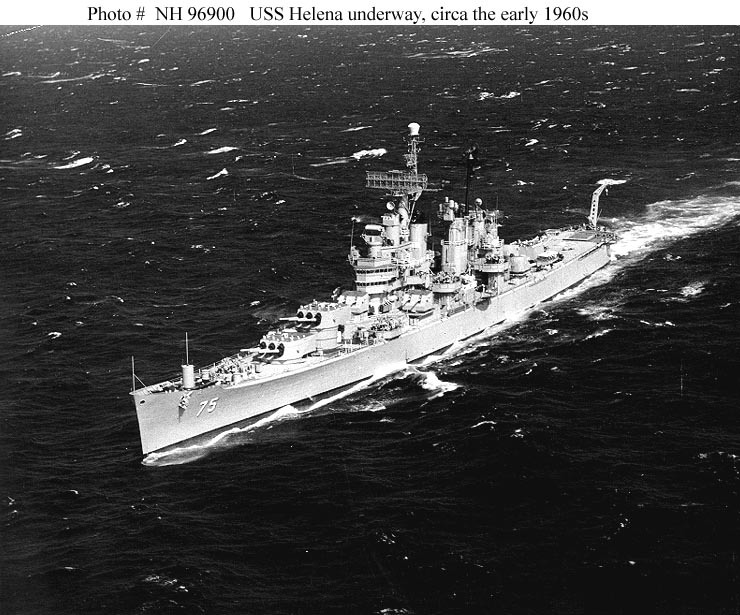 Official U.S. Navy Photograph, from the collections of the Naval Historical Center #NH 96900.